Kombucha is a nutrient rich fermented drink which probably originated in China. It has certainly been consumed there for thousands of years and is well established in Japan, Eastern Europe and Russia too. It turns tea and sugar into something that tastes like a good vintage of sparkling apple juice. This seeming miracle is enabled by a scoby, a sort of thick skinned fungal-bacterial symbiosis. SCOBY actually stands for Symbiotic Culture of Bacteria and Yeast. As the scoby digests the sugar, it forms various beneficial acids, B & C vitamins, enzymes and probiotics. Kombucha is said to boost the immune system, be good for gut health and have a whole host of other benefits. We used to make kombucha regularly and it became an embedded activity in our lives. We’d have a glass every day and felt better for it. It also meant we had a refreshing and delicious drink on hand to offer visitors. Sadly, following a number of house moves, we lost the scoby and the habit. 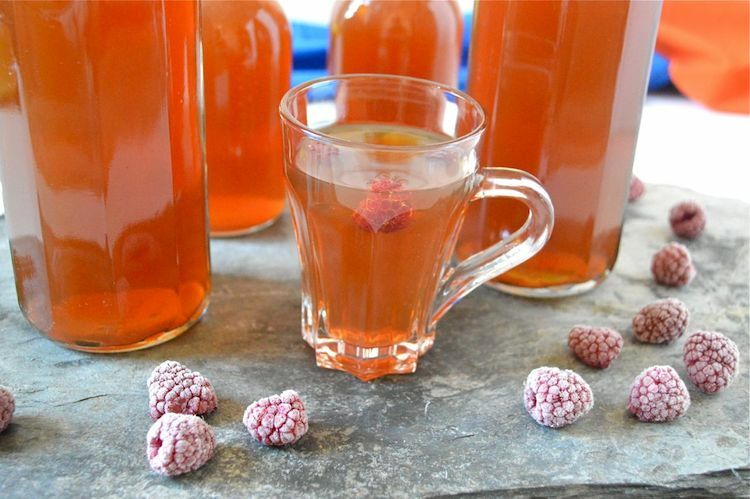 Until Mortier Pilon came to my rescue, I hadn’t made or drunk any kombucha for over a decade. Mortier Pilon makes the most beautiful glass vessels for brewing kombucha. If you’ve got a large container sitting somewhere in your home, it sort of matters that it looks good. The Mortier Pilon kombucha crock is not only stylish, it’s also very practical. We used a variety of bowls and jars when we were making kombucha all those years ago and trying to remove the scoby and get the liquid out was really quite a messy process. This wonder crock has a tap at the bottom so you can easily extract the liquid and the scoby doesn’t have to be removed at all. Kombucha needs to breathe whilst it’s fermenting, so you can’t use screw top lids or cover your bowls with plates. A lid is needed to keep out dust, but it must be a porous one. Mortier Pilon have this covered. There is a large screw top, so it’s easy to fill the crock and remove the scoby if needed, but it has a clever aperture in it, on which sits a porous lid which allows free flow of air. And it’s a very attractive lid too. It’s really quite easy to start making kombucha. Full instructions come with the jar, though you will need to order the scoby separately. Kombucha typically takes from a week to a fortnight to ferment, depending on the ambient conditions and how sweet or sour you like your drink. Once fermented, the kombucha can be consumed immediately or bottled. The drink has a slight fizz to it when consumed straight aways, but when bottled it gets much fizzier. The Mortier Pilon instructions say to add a little more sugar at the bottling stage to increase the fizz, but I’ve found this unnecessary. I’d rather not add more sugar than is needed. There are a few things to remember. The scoby is sensitive to some chemicals including chlorine and essential oils. It’s therefore best to use organic tea if you can and make sure your water is filtered. Use unscented black tea to begin with and never Earl Grey. It’s not like me to promote white sugar, but it really is best to use pure white sugar for kombucha, not golden or brown or honey or anything else. There’s a handy little how to make kombucha video on the Mortier Pilon site. Once you’ve got your scoby growing well and you’re producing a drink you’re happy with, you can start experimenting with your kombucha. In the past we found that using half black and half green tea gave a nice result. At the bottling stage, you can add fruit slices or juice, herbs or spices. Raspberries are a particularly nice addition. The fermentation jar can also be used to make tibi otherwise known as water kefir. This is something we often make as a refreshing summer drink and I can see how the crock would would be so much better than the jar we currently use. If you forget about your kombucha and find it’s gone too sour, just leave it for an additional couple of weeks. You’ll find that you’ve made your own vinegar and a very nice vinegar it is too. I use it almost exclusively now for salad dressings. Once you’ve syphoned the vinegar off, just carry on as normal. 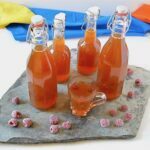 A delicious fermented sparkling drink that has many health benefits and tastes similar to fizzy apple juice. Sterilise your Mortier Pilon fermentation jar by washing with hot soapy water, then rinsing or running it through a dishwasher. Place the teabags in a large teapot or jug. Boil the water and pour over the teabags. Leave to brew and cool to room temperature. Pour into the fermentation jar and add the scoby and kombucha liquid. Screw on the lid and add the porous cover. Leave at room temperature for 3-5 days. Make sweetened tea as above, but use the larger quantities stipulated. Use a long handled spoon to push the scoby to one side and pour in the tea. Leave to ferment at room temperature for 7-14 days, depending on how sweet / sour you like the drink. Test after 7 days and then just keep trying until you have something you like. The kombucha should have a slight fizz to it. Using the tap at the bottom, pour 2/3 of the kombucha into flip top bottles. The longer you leave them, the fizzier the drink is likely to get. Repeat the primary fermentation process. The scoby needs to acclimatise to its new environment, hence needing a starting up stage. The scoby can be stored in a glass jar with some of the kombucha in the fridge. Mortier Pilon sell a range of high-end fermentation glassware designed to make fermenting more accessible to the home user. The company is based in Montreal, Canada, but has recently launched in the UK. Their products are very reasonably priced. We bought a sauerkraut earthenware pot a few years ago which I remember being very expensive. A Mortier Pilon one costs £34. The kombucha fermentation jar costs £39. They are available via a range of outlets, including John Lewis and Amazon. 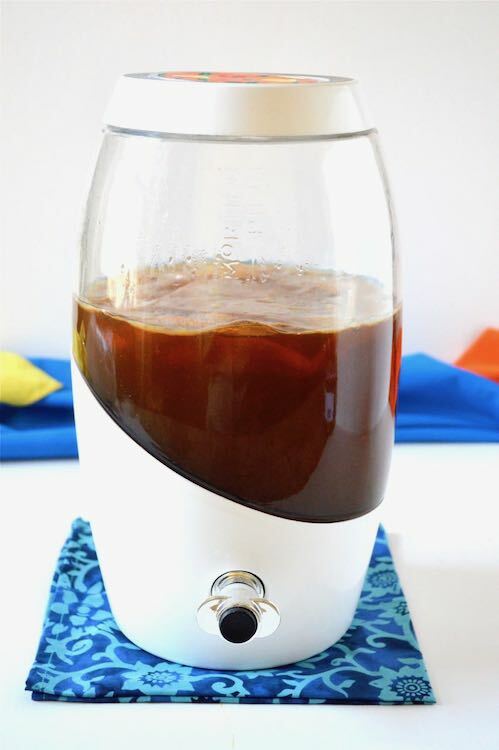 If you have a go at making kombucha, I’d love to hear about it or see a photo. For more nutritious and delicious recipes, follow me on Twitter, Facebook, Instagram or Pinterest. 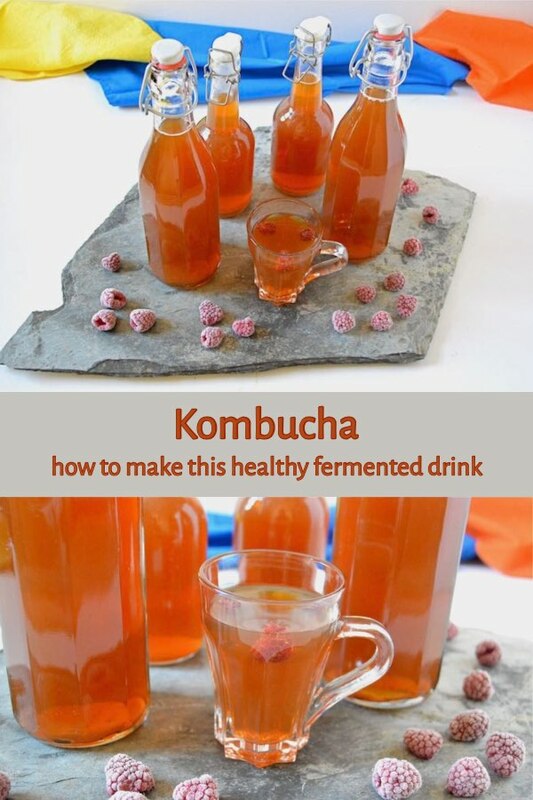 How to Make Kombucha. PIN IT. Thanks to Mortier Pilon for commissioning this post. I was not expected to write a positive review and all opinions are, as always, my own. Thanks to my readers for supporting the brands that help to keep Tin and Thyme blythe and blogging. Definitely worth trying Theresa, especially for your mother. Kombucha is relatively easy as you can make quite a large quantity, but only need to deal with it every ten days or so. This is so on trend at the moment, but I still haven’t tried it. I really need to give it a go! It’s fun to see some of the weird things we’ve been eating and drinking over the years become trendy. I’ve still never tried kombucha! I need to find some. This sounds like a great, simple way to make your own. I’ve only ever had homemade, so I can’t comment on commercial varieties, but I suspect homemade is best. Totally something I still need to and want to try! Thanks Aimee. It’s wonderful stuff and the Mortier Pilon kombucha crock is pretty good too. I’m so intrigued to try kombucha. I’ve heard so many good things! It’s pretty amazing stuff Kate, well worth trying. I am already a fan of Mortier Pilon having experimented with their kimchi/sauerkraut crocks, but I really want your kombucha crock too! I have never made kombucha but after initially being much puzzled by the taste, I’ve come to find I really like it. I really like your instructions. Pinning, etc to try soon! Thanks Kellie. I’m really impressed with the kombucha crock and so excited to be making it once again. I really like the taste and the sparkle that comes with it. I’ve never tried drinking a commercial variety, so I’ve no idea what they’re like, but they are generally pasteurised I believe, which rather defeats the point of kombucha. I’ve never made it before either but I think I’m going to give it a go when I get back to Slovenia next month. Where do you get your SCOBY from? I got mine from Mortier Pilon, they sent me one along with the fermenting jar. They are available online from them and various others too. Or if you know someone whose got Kombucha, they might be able to give you a piece of one of theirs. I have heard so many things about kombucha but it is not something I have ever tried (yet). Loving that little new gadget – that could come in handy for so many recipes! I’m sure you’ll get around to it. The main thing is getting hold of a scoby. Once you’ve done that, the rest is pretty simple. But this fermenting crock does make it a bit easier. 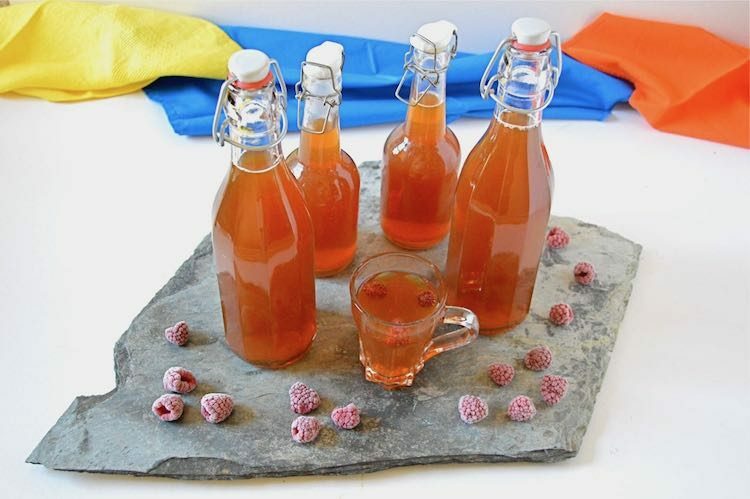 I haven’t tried kombucha but I love the idea of fermented tea especially adding the raspberries at the bottling stage. A really interesting post Choclette. Thanks Sarah. The raspberries makes this rather tasty drink an outstanding one.